The Smart Live Casinosurely is set to quench your thirst of gambling with their range of the best online gambling games. The site provides with some of the most thrilling casino games, of course along with their live gambling games. This casino has introduced a number of new features and makeovers from time to time, making sure their members settle for nothing but the best. First Deposit via NETELLER and get up to £200 Bonus! The games of the Smart Live Casino are powered by some of the best live gambling game studios, you can find out there. NetEnt, FinSoft, BetSoft and Ongame Poker does the brilliant job of churning out some of the top class games for them. We especially liked their Live Dealer Rapid Roulette game; it is a much better alternative to the usual Roulette games. These games take only about twenty-five seconds to complete, meaning you can set a higher number of wagers in shorter time. 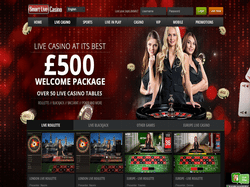 The Smart Live Casino site has an uncluttered and straightforward user interface, this does account for a better playability online. The loading effects of the site are pretty neat too; you can get the four suites of the cards to light up as the process progresses! We really liked the layout of the site, it allows you to easily access the content in demand, while also at the same time informing you about the same. Scroll down and you also get the links to their Facebook, Twitter and YouTube pages. Roulette Variants. You can enjoy both the European and the American Roulette on the site. You can either get playing the games on your PC instantly, or get them on your mobile. Getting the games on your mobile is easy as a pie, you are offered several convenient methods to achieve your objective. You can either scan the QR Code with your mobile to get the link, or enter your email for the links to the appropriate version of the apps. The Smart Live Casino does make sure that you get enough bonuses to play with, at the casino. Combine their best in class bonuses with the excellent live dealer Roulette games, and you are up for a quality time at the casino. Their welcome bonus itself lets you scoop up the enormous amount of £500, along with free spins at games! Their Neteller Special bonus, presently is offering an extra £200 if you make your first deposit via Neteller. The special game bonuses can get you up to 50 free spins, with the Slots Game of the Day. When it comes to the customer satisfaction of this wonderful live casino, you are not at all compromised in any aspect. The staff behind the casino are quite eager to provide you with the best online gambling experience, resolving your issues if they arise, quickly. On their site they provide an online chat functionality, with relatively low response times. However, if you want to, you can also get in touch with them via their customer helpline or email. To conclude, we do say that gambling at the Smart Live Casino can be an exciting affair.